The OTHER Star Trek auction this week is the regular Profiles in History Hollywood Auction # 49. There isn't a lot of Star Trek compared the the Drier Collection. In fact there are only 12 items, and 4 of them are paperwork. But after yesterday's Drier Auction (results here), most of us who aren't millionaire's are tapped out. But frankly, the two big pieces here are not for your average collector! 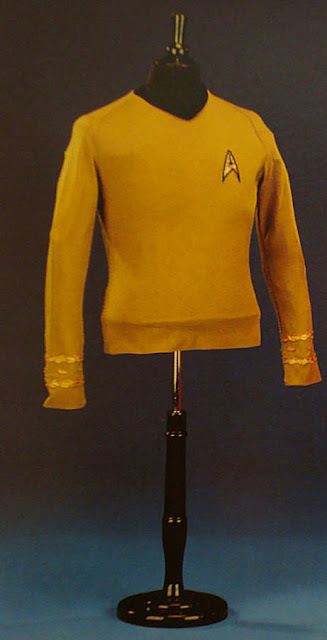 First and foremost is the most important Captain Kirk costume ever to come to market. 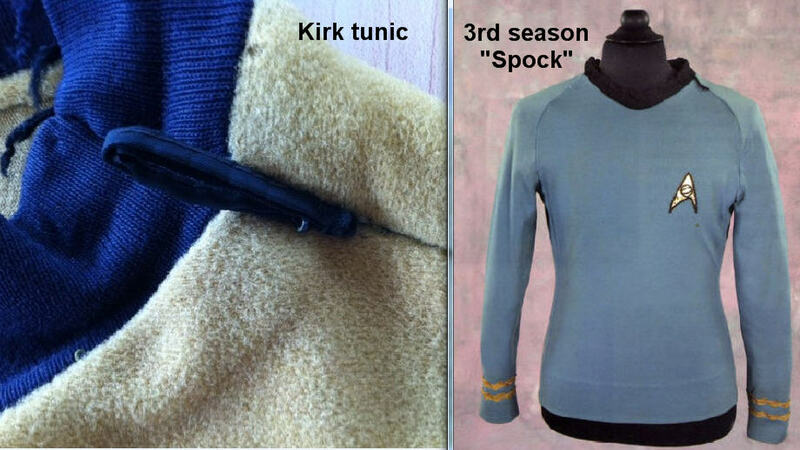 An early first season, William Shatner, gold velour Captain's tunic. I actually discovered this costume as you probably know, and myself and 3 TOS costume experts, James Cawley, Gerald Gurian and Rger Romage, all helped authenticate it. 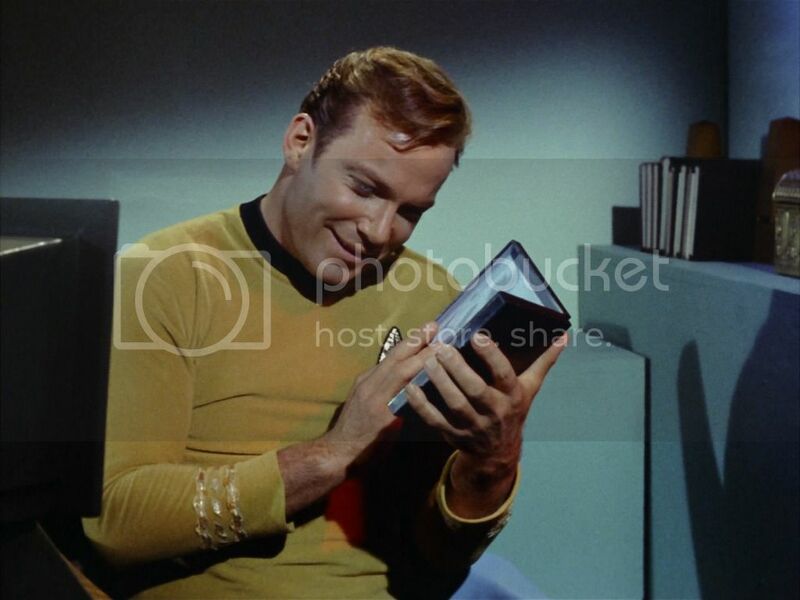 It has been screen matched to both "This Side of Paradise" and "Shore Leave", and there is a 25 page authentication report that accompanies it. You can see it in iCollector here. It has an estimate of $ 80-100,000. Where will it go? $ 125,000 for sure. That is my guess and what I valued this at based on previous auctions. Most importantly, a Spock that went for $ 130,000 and another that recently went for $ 100,000 (thought that was with pants). The significance of this piece cannot be understated. it is the oldest Kirk tunic that has come to market and it is also in the best condition of any velour of Kirk's. The four pieces of Star Trek paperwork certainly came out of a collection because of the ridiculous prices some paperwork received at the last Profiles auction, which I wrote about here. Lot 903-905 are just letters from Gene Roddenberry and not particularly interesting. Lot # 906 is a set of three TOS scripts, one of which appears to be Gene Roddenberry's personal script, but it is hard to tell. None the less, the lot of TOS scripts is an interesting piece of Star Trek history. I don't collect scripts so I will pass, but some do and you should look at this lot. 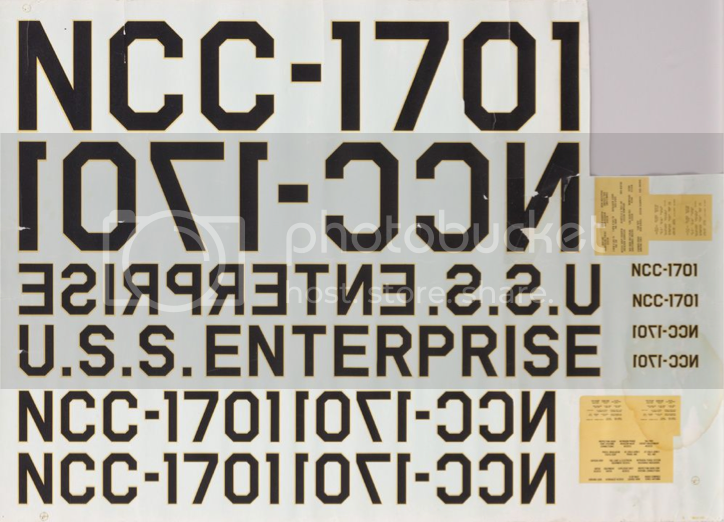 Lot 907 - USS Enterprise Decals from The Original Series. VERY COOL! You got to love these. I can't believe something so important yet so fragile is still around, and I think it very cool. I will not be surprised to see this go over $ 10,000. I wish we had photos of all 4 sheets! (4) SHEETS OF (250+) VINTAGE U.S.S. ENTERPRISE NCC-1701 DECALS FOR FILMING MODELS FROM STAR TREK: THE ORIGINAL SERIES. - (NBC-TV, 1966-69) Four vintage wet transfer-type decal sheets specifically designed for use as replacements on the Star Trek: The Original Series 11-foot and 3-foot filming miniatures of the U.S.S. Enterprise on the Howard Anderson visual effects stage on the Desilu Studios lot between 1966-69. This item is really exciting, though not something I would have in my collection with so little money to spread around! Lot 908 "Nona" Necklace from "A Private Little War". I have seen the top from this costume in someone's collection, so I hope they get this necklace to go with it. Otherwise, pretty uninteresting. Lot 910, a First Contact EVA Phaser Rifle. We just saw one yesterday that went for $ 3,250, so this one should go for less. If you are a Phaser Rifle completest like me, you need one of these. Lot 911 Boomerang Phaser - TOTALLY wrong description. "This boomerang style phaser is worn by Kate Mulgrew “Captain Janeway” in the Voyager episode, “Endgame”, and is only used in this episode. This style phaser is the basis for the phasers used in Nemesis"
The phaser they are talking about is a Dolphin Phaser and this is not this one. UGH. Very cool and would be perfect for that Khan costume that The Prop Store sold last summer. Whoever bought that costume needs this! (I am like a prop and costume matchmaker). I haven't screen matched this so can't venture to guess to its authenticity. There have been so many Tricorders and the one in the Drier Auction went at a pretty reasonable price. This is a medical Tricorder and I assume authenticated with Michael Moore from HMS who is THE authority on these since he designed and made them. Finally, the other great item is a piece of the original TOS Enterprise bridge. 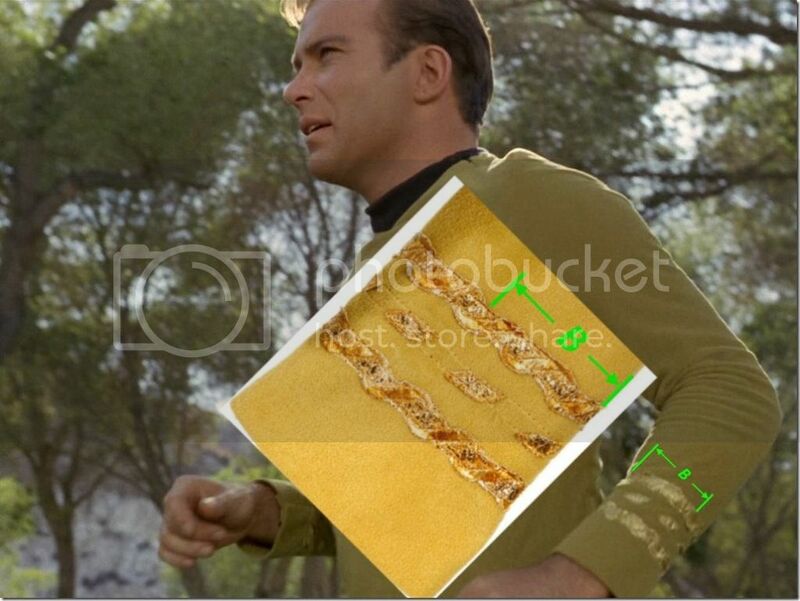 But not just any item, but the translight of the Enterprise. This panel originally sold in the first Propworx Star Trek auction in 2010 for $ 14,000. So it will be interesting to see what it goes for here. 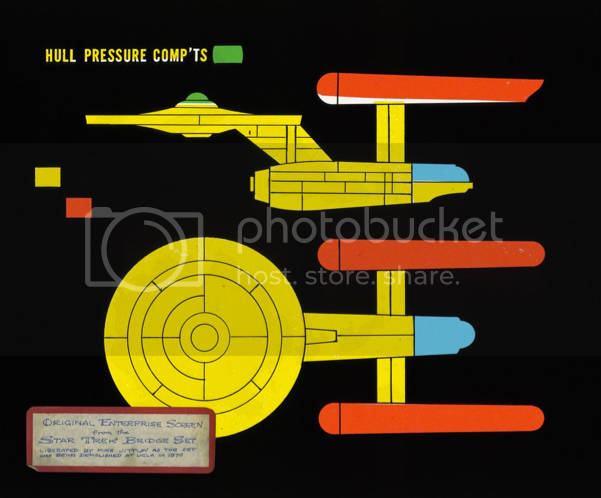 ORIGINAL SCREEN-USED U.S.S. ENTERPRISE BRIDGE PANEL FROM STAR TREK: THE ORIGINAL SERIES - (NBC-TV, 1966-1969) Original 12 in. x 10 in. monitor graphic from Star Trek: The Original Series. This screen was created for and used on the bridge of the U.S.S. Enterprise from the first pilot episode all the way through to the end of the third season. The monitor graphic was situated directly to the left of the main helm console on the outer ring of stations. Once the series ended, the set was dismantled and donated by Desilu to the UCLA Drama Department. When UCLA decided to abandon the set in 1970, Mike Jittlov (of The Wizard of Speed and Time) rescued this treasured set piece. The graphic panel consists of overlaid multi-colored gels sandwiched between glass panes. Black gaffing tape on edges holds the panes together. The panel served as the light emit- ting graphic screen atop a light box. A paper label is affixed to lower left, which reads (in full): “Original Enterprise Screen from the Star Trek Bridge Set Liberated by Mike Jittlov as the set was being demolished at UCLA in 1970”. My guess is this goes for over $ 20,000. 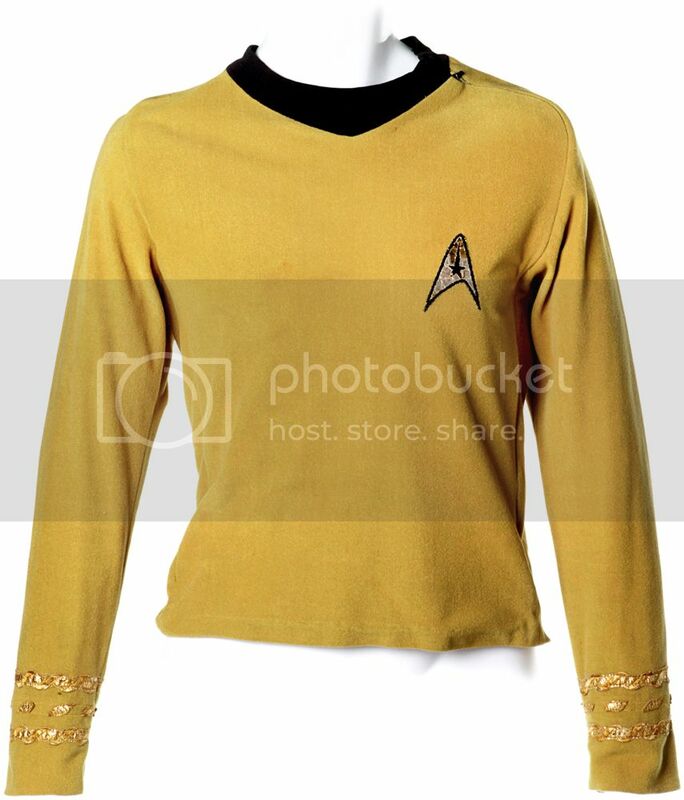 So many lesser props have gone for crazy money and this is a very significant piece of Star Trek history. This weekend, Profiles in History will hold the auction for The Dreier Collection. The Dreiers are of of the premier Hollywood movie memorabilia collectors in the country, and after years putting together an amazing collection, they have decided to sell the entire collection. Now their collection has a lot of good Star Trek items from TMP on. The breadth of the collection is good. Lots of key costumes, almost every type of Phaser weapon, tricorders. It is a good representation. So there is something for everyone I think. The Dreier Collection auction happens Saturday July 28th at 11:00am and you can download the catalog here. The auction is held on iCollector and you can register and bid here. And, as I always say about Profiles in History, what is the provenance? If you are interested in any of these items, you call Brian or Fong at Profiles up (both awesome, friendly guys) and you ask them for details. This is a beauty and should hit $ 10,000 easy I think. What is special is the mannequin and the makeup to make the costume complete. It appears to be an IAW item, but again, if you want to spend the big $, you better call Profiles and check on the provenance. 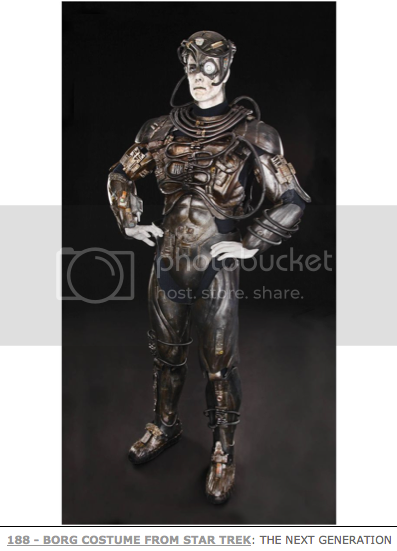 An opening bid of $ 6,000, this costume is headed over $ 10,000. 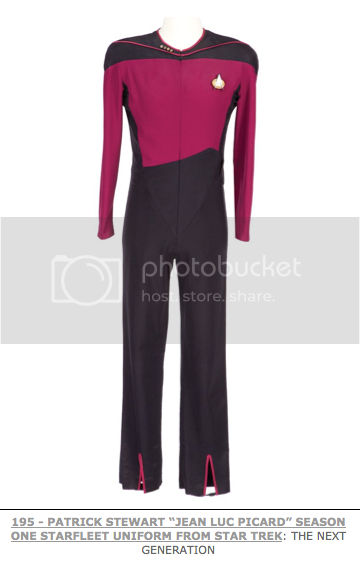 It is the best known Picard costume I think, and more desirable than the later, two piece costume. I would trade my Picard "Generations" Veridian III costume for this AND pay $ 5,000 in a heartbeat just to have this version. My guess is this will be hotly contested. You know I think of these costumes as one piece that comes apart (yeah, makes no sense, but that is how my brain works!). So the tunic without the pants just doesn't work for me. That being said, I think this is maybe a $ 5,000 item. I assume there is no provenance stating this was used by Worf, so the fact it is metal would be what leads one to assume it was used by Worf. But if you are serious, you should call Profiles. 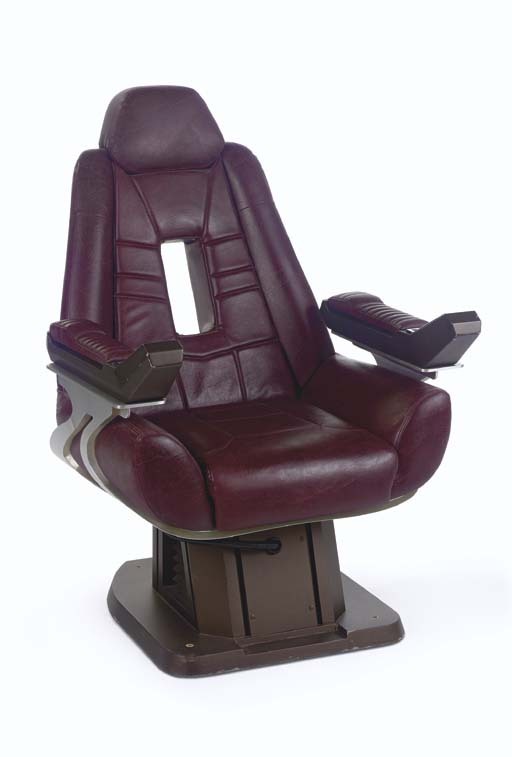 Acquired at the Christie's Star Trek Auction where it sold for $ 62,400 (including BP), this chair will get maybe half that. It isn't iconic like a TV chair and the excitement of Christie's has worn off. I strongly urge you to download the catalog. Besides that there is so much good stuff you should check everything out. The whole Dreier catalog is pretty awesome. And tomorrow I will publish a preview of the regular Hollywood auction Profiles is holding the same weekend. As most of you know, Adam Schneider and I won the Galileo Shuttlecraft at Auction in June. This is the full sizeset piece used in "The Galileo Seven" and other episodes. It is in very bad shape and we are heading out to Akron, Ohio to take possesion and get the process rolling. You can follow our progress tomorrow on my Twitter. Follow @alecpeters for live updates from the site and lots of photos. The TOS Shatner Kirk Tunic Part IV - "Shore Leave"
After James Cawley spent time screen matching the Shatner Kirk tunic, Gerlad Gurian went at the screencaps to try and match the braid. And of course, Gerald, being rather meticulous, did just that. It is amazing the number of "experts" on Internet forums who have no clue what they are talking about. I am not an expert on TOS costumes, although after the education that James, Gerald and ROger gave me, I certainly know more than most. Still I defer to these guys who have put in the work over years and years. And screencaps don't lie. 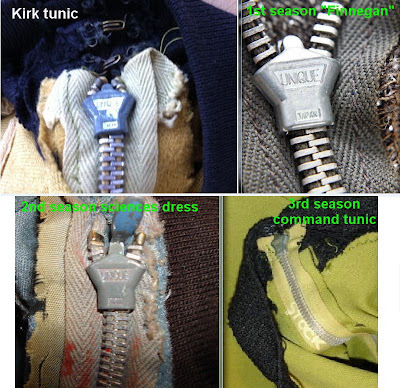 The TOS Shatner Kirk Tunic Part III - "Shore Leave"
The Kirk tunic I owned was clearly an early first season velour Shatner Kirk tunic. The rib-knit collar with drawstring was a dead give-away. And while Gerald Gurian and I had previously positively matched the Kirk Tunic in Profiles in History with "This Side of Paradise", James Cawley was convinced it was also the tunic in " Shore Leave". 1) The collar at the point had a small indent on the left. 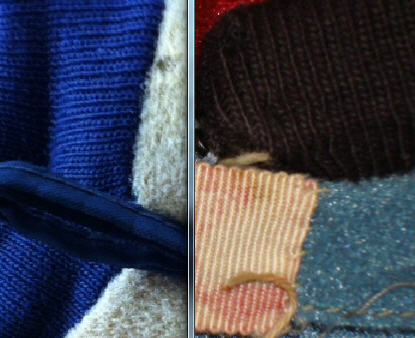 2) The patch was sewn on in a distinct way. 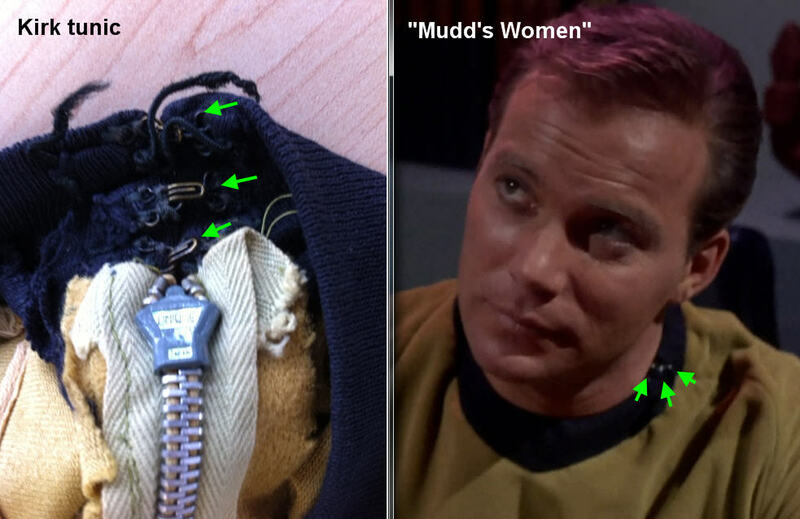 3) The collar where the zipper closure hits the black collar was the same. 2) Patch Right Side "point"
The patch is sewn on with the right side (looking at it) point pointed outwards, not down as usual. 3) The collar where the zipper closure hits the black collar looks the same. Now this is the hardest to verify and probably the weakest argument. 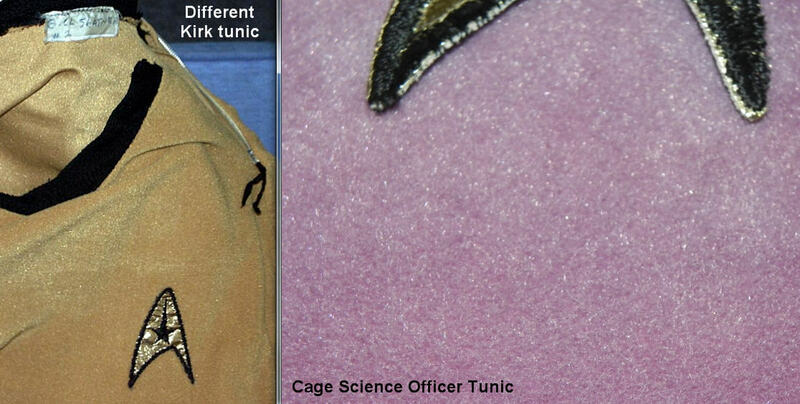 It is hard to tell, but with everything else we know, it reinforces that this is the same tunic. Thanks to James for his hard work here. His attention to detail and understanding of tailoring and costume design is a huge asset to this process. James has given us a lot of insight into HOW these tunics were made. What this also did is get Gerald going and tomorrow I will post the screencaps of Gerald's "Shore Leave" braid match. 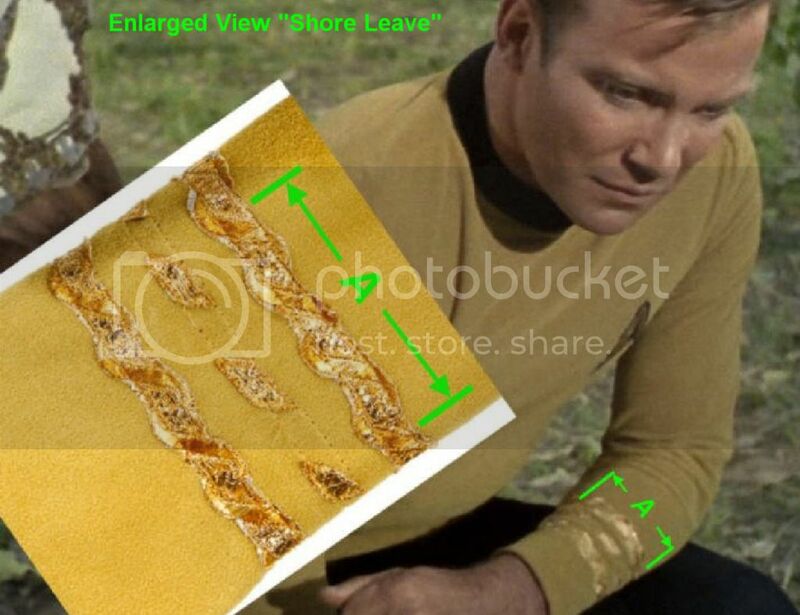 1) Was Shatner's Hand used in Close Ups? 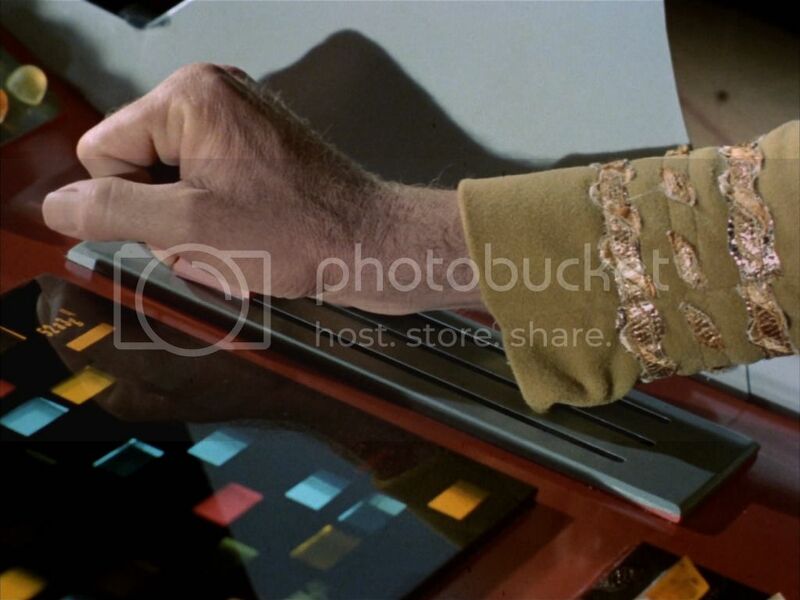 2) Can we screen match Shatner's hand in the above photo? 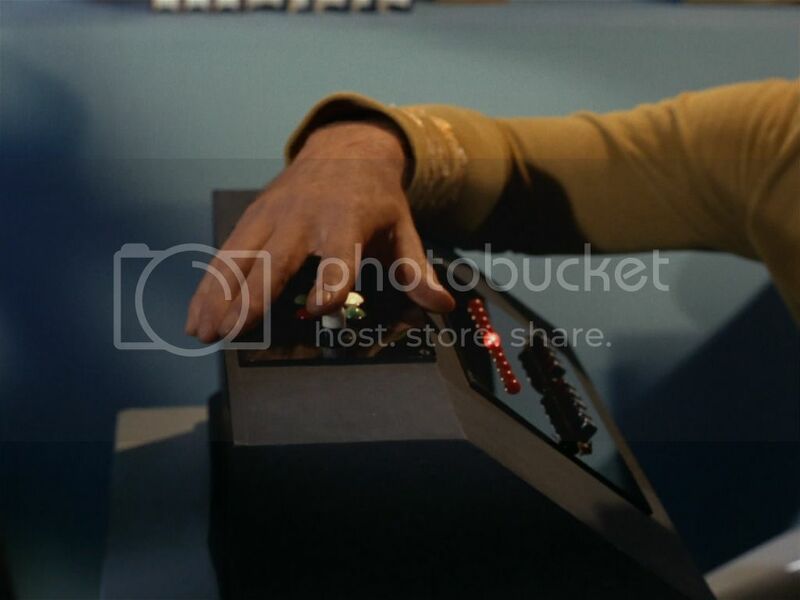 First we will deal with # 1, was Shatner's hand used in close ups? 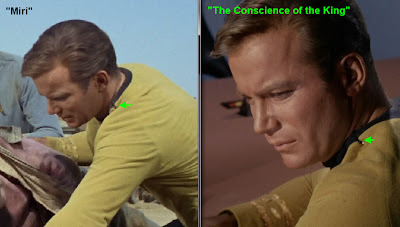 Here is the same type of example from "This side of Paradise", the episode with the transporter screencap positively identifying the tunic. 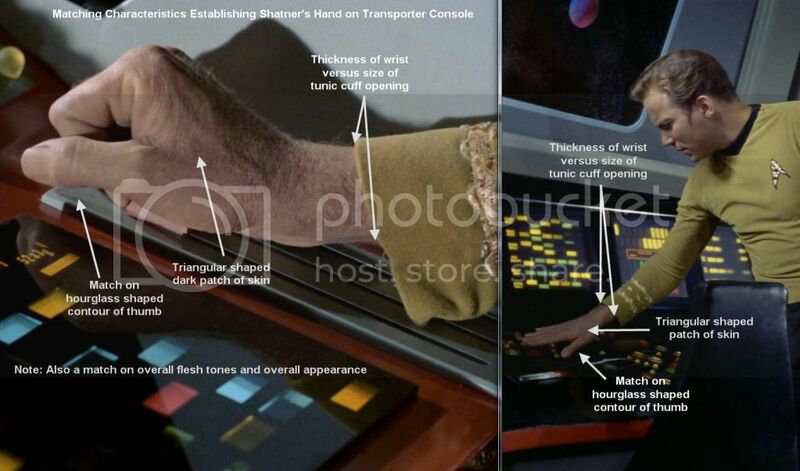 So we see that Shatner's hand is used in close-ups. They don't generally bring in a stunt or photo double. 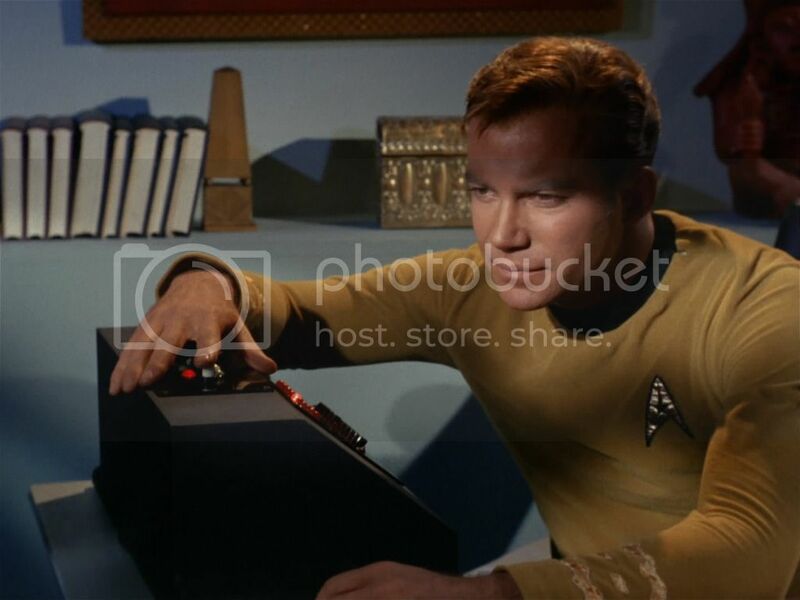 Point # 2 Can we screen match Shatner's Hand in the photo authenticating the Tunic? 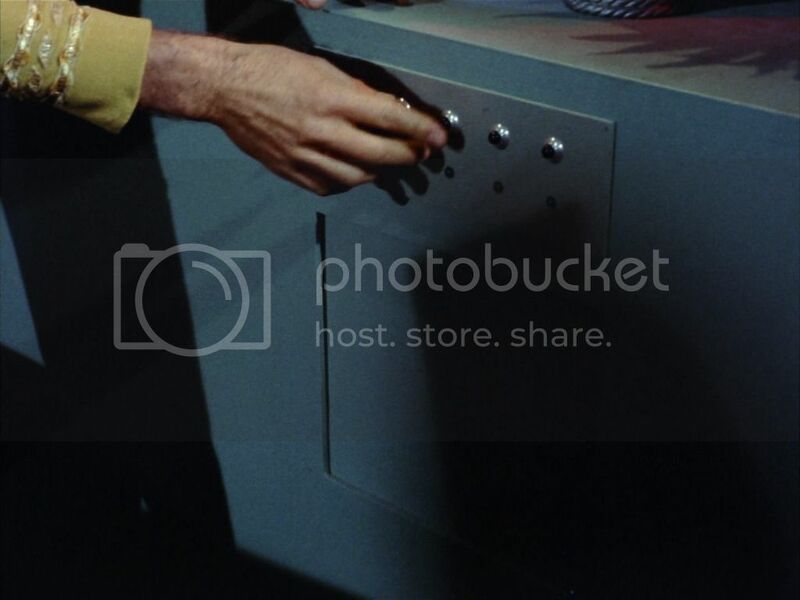 Proof Positive that this is Shatner's hand in the first photo. The screen match of the braid in this photo from "This Side of Paradise" is 100%. And now we know for sure that is Shatner's hand. 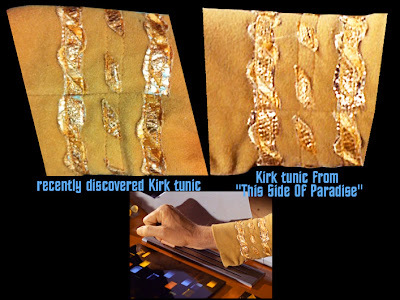 So we know for sure that the Kirk tunic at Profiles in History is in fact a Shatner Kirk Tunic and probably the earliest ever to come to market. 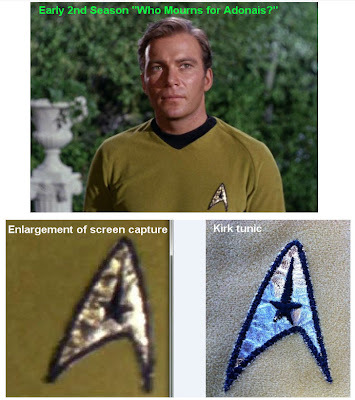 Also, James Cawley says that he believes he has screen matched the Kirk Tunic to "Shore Leave". We will be posting his findings shortly. 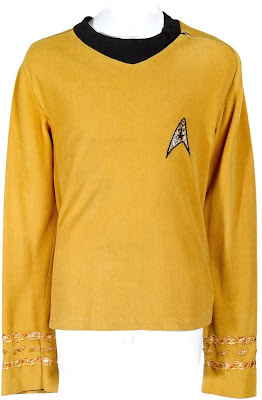 The TOS Shatner Kirk Tunic at Profiles in History. 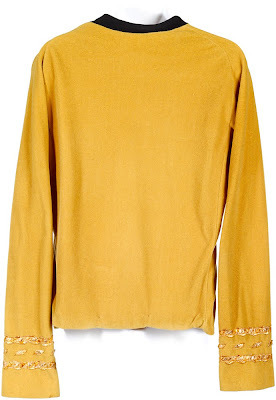 While some people know this, it is not public knowledge, but last year, I acquired a William Shatner Captain Kirk Tunic. 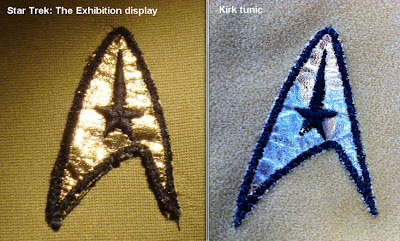 Yes, a holy grail to almost all of us Star Trek prop & costume collectors. It was an amazing find and literally walked in the door of Propworx. (OK, it had help walking in the door). 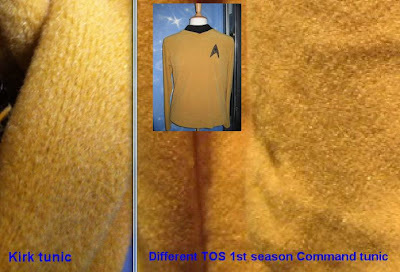 So I got three of the four top experts on TOS costumes to authenticate this costume. James Cawley worked for Bill Theiss, Roger Romage has studied everything TOS since the 60's and knows the costumes better than anyone I see regularly post anywhere. And Gerald Gurian has spent an enormous amount of time analyzing the multiple costumes he has had access to and does an amazing job with photo essays of TOS costumes. Each of these experts separately reviewed the tunic and all came to the same conclusion. 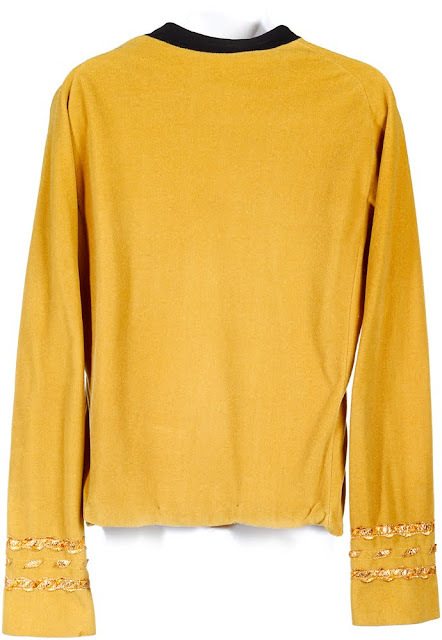 It is an early First Season William Shatner Kirk tunic. James Cawley's knowledge of these tunic is first hand from handling so many of them working for Bill Theiss. James even owns the original patterns from Bill. Many know James from his well known fan film "Star Trek: Phase II". If you go to his set, James will spend hours talking Star Trek costuming, and his knowledge is impressive. Gerald and I had a rocky start to our relationship, but have since become best of friends. Just goes to show you that when you share a passion, friendships blossom. 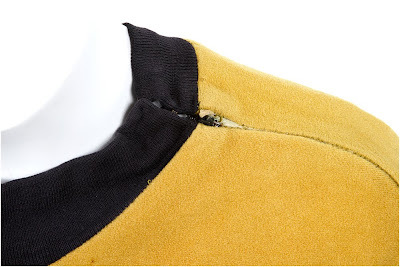 Gerald was the one who first noted that the Sulu Tunic we had in the first Propworx auction was not 3rd season, but Phase II. Gerald does more work on authenticating items than anyone. He will spend hours just getting the right screen match. 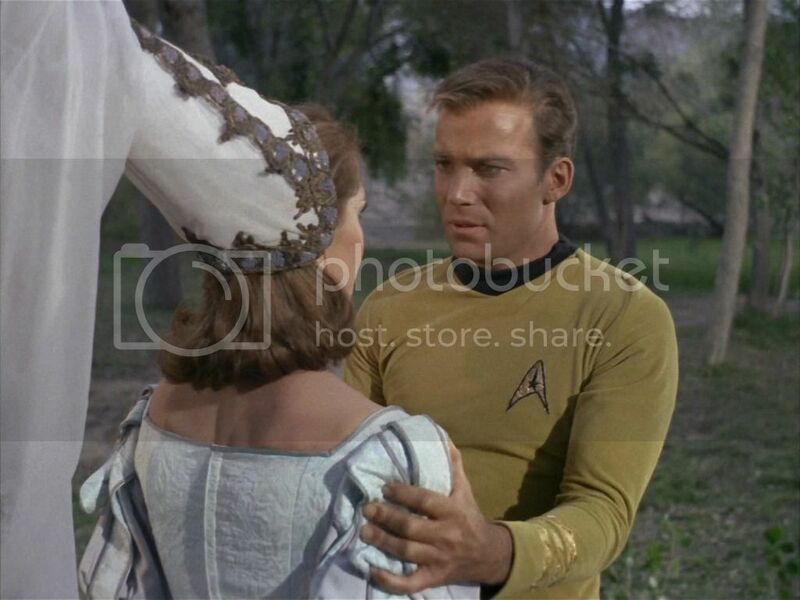 And he has handled and photographed lots of TOS costumes and done extensive photo analysis of them. Check out his blog here. So, how about some authentication of the Kirk tunic and the high res photos we took at Propworx before I traded this baby off. I am reprinting much of Gerald's awesome article since I don't want to re-do all his hard work on my blog! Here is Gerald's photo review (Part 1). 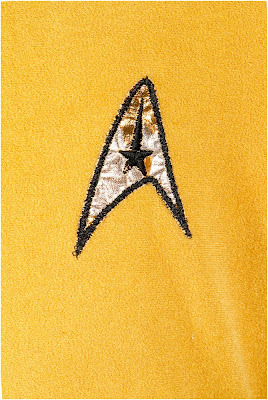 The texture and construction of the velour fabric in this tunic; both on its front and reverse surfaces, is consistent with that used to create the 1st and 2nd season TOS starfleet uniforms. Below is a direct comparison with a 2nd season blue velour sciences dress (sold by Profiles in History, Auction 37, October 2009). 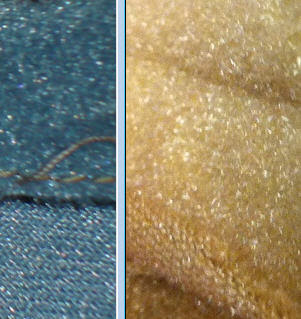 In addition to the matching textures and thread weaves, note the slight "sparkle" effect visible on the front surface of the fabric that is frequently seen when these costumes are photographed at close range with a flash in use. 9. 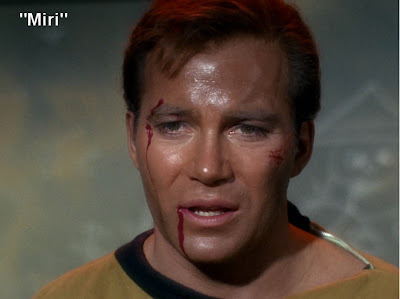 Captain Kirk Braid screen match to 1st Season "This Side of Paradise". This tunic features a double gusset design; or the presence of three seam lines running from the armpit area down the torso on each side of the costume - a design characteristic that is considered by knowledgeable Star Trek experts to be only present on those TOS command tunics specifically tailored for wear by William Shatner. The double gussets on this tunic, as well as two photos in which this unique construction detail is visible on William Shatner in costume, is shown below. There is more info to come. Stay tuned for the next post.